PHOTO BY NEILAND BRISSENDEN/GLEANER NEWS: Jim Snowdon, shown in front of his Bloor Street West pharmacy, is known for patient care. 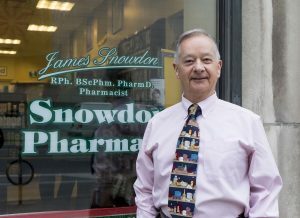 Dr. James “Jim” Snowdon has been pharmacist to the Annex for 47 years. Serving clients from his eponymous pharmacy with a patient-first, innovative attitude, he’s as likely to be seen chatting and smiling with his customers as he is behind a dispensary. It’s a commitment that the Ontario Pharmacists Association has recognized, bestowing Snowdon with its Lifetime Achievement Award last month. Snowdon has never been in it for the awards, and the recognition is a validation that he has been doing the right thing for all the people he serves. 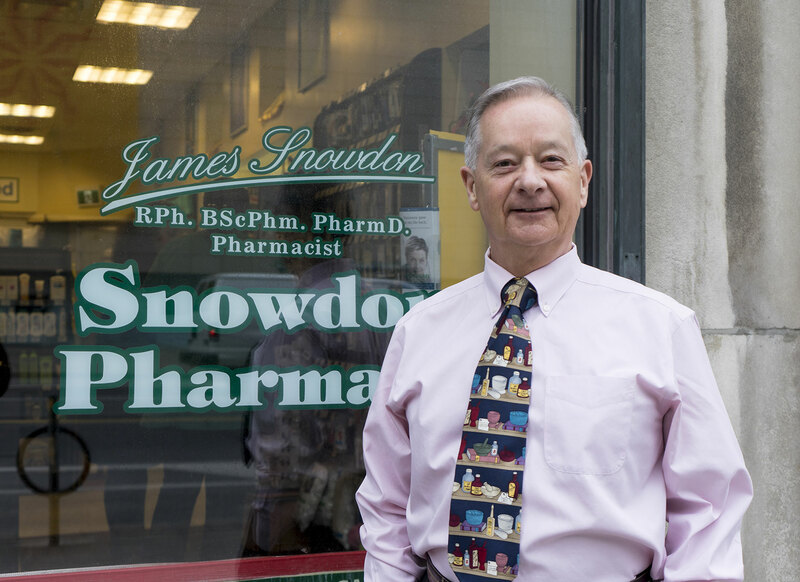 Snowdon’s family has been in the pharmacy business for over 100 years. This history is easy to see when you enter the pharmacy, where family memorabilia lines the walls. The history of medicine is also on display: a museum near the counter showcases all sorts of old-fashioned medical tools. In the centre, in pride of place, is a pillar with diplomas for himself, his father, and his grandfather. It’s an enthusiasm that doesn’t go unnoticed; in fact, it permeates the space. Snowdon’s office — in the front of the store — is marked by openness and colourful decorations, so patients are immediately put at ease with a friendly attitude and welcoming spirit. According to long-time Snowdon staff pharmacist Jelena Sergejev, this attitude is a cornerstone of Snowdon’s ideals. She is just one of the many student interns that Snowdon has mentored over the years, igniting in them a passion for patient care and service. But it’s not just a kind attitude that Dr. Snowdon brings to the craft; he has led the pharmacy profession throughout his career. He was one of the first pharmacists to start offering flu shots to his customers back in 2010, long before other pharmacies started offering the vaccine. Since Snowdon has been in the pharmacy game for so long it might be expected that he would grow complacent but this is the furthest thing from the truth. He is always looking for a new way to be innovative.